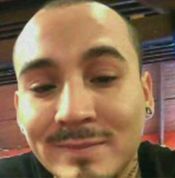 ALDINE – A brother trying to defend his sister was fatally stabbed at an apartment complex on AldineMail Route on Monday, July 13, 2015. It happened around 4 pm in the 4800 block of Aldine Mail Route near highway 59. Detectives said the victim was trying to defend his 17-year-old sister from allegedly unwanted sexual advances from the suspect, Sean Jimenez, 21. Officials reported that the girl called her brother to come and help her. They got into an argument and fight that turned deadly. The attacker then allegedly grabbed a knife and stabbed the girl’s brother, Joel Gonzalez, 22, at least one time in the torso, killing him, Harris County Sheriff’s Office Sgt. Robert Spurgeon said. Jimenez took off running. Deputies searched a nearby wooded area by air and on foot but could not find him. The next day, Jimenez turned himself in and was questioned. But he later was released because he claimed self-defense. The case will go to a Harris County Grand Jury. 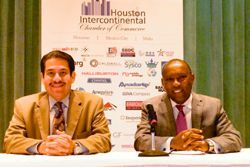 Chamber president Reggie Gray explained that this was an informal discussion, and that he had invited two of his personal friends, candidates Adrian Garcia and Sylvester Turner, to discuss issues and strategies that they saw for Houston’s future. It was staged in the Galleria area, he said, because the Chamber is expanding its services and membership into this area. He also said that a full candidates forum would take place in the fall, including all the candidates who have declared that they are running for Mayor, but that he viewed this luncheon as more of an informal chat with his friends. Garcia and Turner both made opening statements, and then answered a few questions from the floor. Garcia talked about his family history, and that in 1959 his family immigrated from Mexico to Houston, and that Adrian was born in Houston. He has served as a police officer and city councilman in the Houston government, as well as Sheriff for Harris County. He characterized Houston as a “welcoming” town, and its strengths include a multi-cultural diversity. His talk focused on the Economy, saying the four pillars of our success were Energy, the Medical Center, Aerospace with NASA and the three airports, and the Port of Houston. He strongly believes that although Houston has accomplished much, it can do more, and he can lead that effort. He said he will promote “P3” projects, meaning with Public/Private partners. He also plans to travel on behalf of Houston, saying that it will build and strengthen relationships, and that is important. Sylvester Turner said his family is Texas rooted, having moved to Houston in 1954 from Washington county. He is a graduate of the University of Houston and Harvard University, and has practiced law in his own firm for 32 years, and been a Texas legislator for 26 years. He has been chosen by Texas Monthly as one of the best legislators in Austin. Turner believes that Houston is a world class city because its leaders have “Dreamed Big” and will continue that. He spoke in detail about budget challenges, and said that the Infrastructure must keep up with our growth, but now is outdated with poor quality city streets. He proposed a “Road to the Future” to have a 24 hour Road Repair program, involving our Community College graduates. Among his accomplishments, he spoke of securing scholarships for Lone Star College Victory campus, and working with Major League Baseball to turn 29 acres in Acres Homes into a national facility at Turner Park. He said that HB9, which he supported, solved a crisis with pensions for state employees, and how the legislature has voted additional funds for the transportation need of the area. And he says he follows his mother’s advice: believe in yourself, work hard, and don’t settle for being second. After the presentations, questions came from the audience. On immigration, Garcia said he was against sanctions, and that immigration was good for the economy. On transportation, Turner said that we should have a multi-modal solutiohn. Garcia said a rail line from the airport was a priority, and would use P3 funding for this. On bringing more business to Houston, Garcia said he would travel to find businesses to attract, and he would reduce bureaucracy, and leverage tax abatements and take advantage of management districts. Turner said he would rely on a young work force, a better infrastructure, and showcase and sell our strengths. Chamber president Reggie Gray thanked the speakers, noting that in his opinion Houston would be well off with either one. Gray also said the chamber is expanding with an additional board of directors, so that now there will be an International, North Houston, and Galleria boards.